Darcy has plans. She and her friend are going to play dress up, do each other’s hair, and polish their nails. Daddy has plans, too. He’s going to read the paper, mow the lawn, and fix the fence. When Darcy’s friend cancels and she’s sure her day is ruined, Daddy suggests a Darcy-Daddy Day. Now they can tackle their to-do lists together. But will Darcy enjoy hammering? Will Daddy do nails? You bet! Join Darcy and Daddy as they discover the fun in trying new things, especially with someone you love! Celebrating the bond between an exuberant father and his young daughter, Bledsoe presents a warmhearted picture book about an unusual day the two spend together combining what both like best. …While the relationship between a father and daughter can be special, Bledsoe presents the atypical premise of what it means to compromise the radically different interests of both. Warrick’s expressive full-color illustrations perfectly express this theme in a comical way. Big Daddy, for instance, is represented as a brawny he-man and yet is willing to look silly in a tutu for his “princess.” Further, he forgoes the practical task of washing and folding laundry by playing a messy game of throw and catch the socks with his daughter. Darcy is also willing to help with the household chores given a little guidance. There are fewer stories about the father-daughter relationship than the mother-daughter one, making this book an especially unique find, ideal for sharing. The concept of compromise is as worthwhile as the idea that “sometimes things you’ve never done end up being fun.” VERDICT A unique picture book that is best shared by a father and daughter and is well worth being read more than once. …Newcomer Bledsoe creates a humorous and relatable portrait of compromise and familial affection, while Warrick’s watercolors strike a lovely balance between burliness and daintiness. Author Josh Bledsoe’s preciously penned book is perfectly paired with adorable illustrations by Jessica Warrick, which are the ultimate finishing touch for this priceless children’s book. Highly recommended for home and school libraries, Hammer and Nails, by Josh Bledsoe, earns the Literary Classics Seal of Approval. …required reading for Father’s Day. …tells the story of how Daddy and his daughter, Darcy, combine his list of chores with her plans for a scuttled play date to make a lovely day together. Each of them ventures beyond their comfort zones as Darcy wields a hammer, and Daddy plays nail salon. (Of course, Dad also makes sure they squeeze in a nap!) Jessica Warwick’s illustrations bring depth and humor to the charming story. It’s easy for parents to get caught up in tackling to-do lists, but Bledsoe gently reminds his adult readers that slowing down to teach our kids how to accomplish tasks — and opening our hearts so we can learn from them — is time well spent. When Darcy’s friend gets sick on the day of their playdate, Daddy saves the day by suggesting a Darcy-Daddy Day, in which they take turns choosing activities for the two of them to share. Warrick’s watercolor-and-digital paint illustrations portray a doting light-skinned father and his spunky daughter with no mention of a mother. Over the course of the day, Darcy and Daddy both learn the importance of compromise and trying new things, and readers will appreciate the obvious respect and love the pair has for one another. Warrick’s energetic illustrations work well with Bledsoe’s humorous text, especially when Daddy remarks to Darcy that he’s looking forward to playing dress-up because his “PJs are so unfashionable.” Fun endpapers featuring hammers and bottles of nail polish complete this warm tale. This book is filled with great examples of “flexible thinking” and discussing options. Lots of … taking turns, trying new things, silliness/humor and showing that even chores like mowing, laundry or fixing a fence can be fun if you use your imagination and are working together. …Hammer and Nails is a perfect Father’s Day book. Dads are not represented in picture books as they should, usually being the one out of the house for the day. Hammer and Nails takes a day and turns it on its heels. Mom? She’s out of the picture. It is all Daddy and Darcy, all day. Both must do things they never envisioned themselves doing—hammering and painting nails. Daddy expresses the perfect attitude, telling his daughter, “Princess, sometimes things you’ve never done end up being fun.” Darcy takes Daddy’s hammer in hand and learns to fix a fence—securing Darcy’s castle—finding hammering to be a fun activity. When it is time for Daddy to paint nails, Darcy returns his philosophy. Should dads ever need instructions on how to spend the day with their daughter, Hammer and Nails fits the bill. In watercolors and digital paint, Warrick’s illustrations capture the “Darcy-Daddy Day” perfectly…. Hammer and Nails shows compromise and compassion, along with spirit and sensitivity. Bledsoe never hammers in his message, instead letting his two characters show us how creativity and willingness to “simply be” with your kids can brighten both you and your child’s day. Darcy and Daddy happily enjoy their day, sometimes confused, sometimes unsure, but always with the perfect spirit. Hammer and Nails is a terrific book to share with dad on his day. Hammer and Nails is a lighthearted bow to Father/Daughter days and lasting memories of fabulous fun with reaching towards each other’s worlds. Darcy began her day with grave disappointment because her playdate plans with her best friend were canceled due to illness. Daddy overheard Darcy’s disappointment and offered a creative alternative: Why not combine their to-do lists and take turns doing things from each other’s lists until everything gets done? Comedy abounds as this loving father and daughter take steps into each other’s favorite activities and guess what? Both of them end up having a wonderful day! Kids will laugh at Daddy in a tutu, carefully mowing the lawn to say DARCY. It is her castle, after all. The best thing of all is, both Darcy and Daddy try out each other’s ideas and have fun learning together. 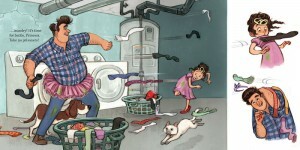 Doing laundry becomes a brave sock battle, and dancing to celebrate is hilarious for both! Darcy even tackles pounding nails on the board fence, and Daddy actually achieved a classy, fancy manicure and pedicure, with Lime-a-Bean Green for Darcy’s nails and Lumberjack Black for Daddy’s nails. In the end, Darcy thanks her dad for Darcy-Daddy Day, and they sincerely compliment one another on their new found skills! “Hammer and Nails!” is great entertainment and also great modeling for dads and daughters who just might enjoy hanging out together. Written by Josh Bledsoe and aptly titled Hammer and Nails, this adorable adventure begins as disappointed Darcy discovers that her playdate plans have gone kaput. In walks her doting Dad, who seems willing to do just about anything (including donning a tutu!) to turn his daughter’s day around. And though his offer for a Darcy-Daddy Day is initially met with some skepticism (exactly what’s on his to-do list anyway? ), Darcy decides to give it a go. And is she ever glad she did! Their playdate starts when the two connect over coffee (and chocolate milk!) and ends with a new appreciation for the everyday things that make each other tick. 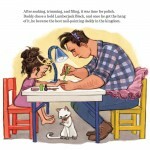 Jessica Warrick’s brilliant illustrations sweeten the story to endear its readers to this darling daddy-daughter duo. As for its eSPAcially clever ending? For the teacher or parent who keeps an eye out for learning opportunities, this delightful book is full of them. Dealing with disappointment, being flexible, trying new things, and making the mundane events of life FUN, are all underlying themes in the book. I can think of lots of times in the classroom and in family life when this book would have extra appeal: Father’s Day; as a baby gift inscribed with “Think of the good times ahead;” or as a gift for a daughter from a Papa who shares this approach to life. When I read this one to my class, before they ever saw it, I asked what a book called Hammer and Nails might be about. Construction, of course. Then I asked them again when I showed them the cover. Hmmm. Then I asked a third time after we read it. That lead to a discussion of the meanings of nail and what a homonym was. Common Core standard on word meanings – nailed! (snort). 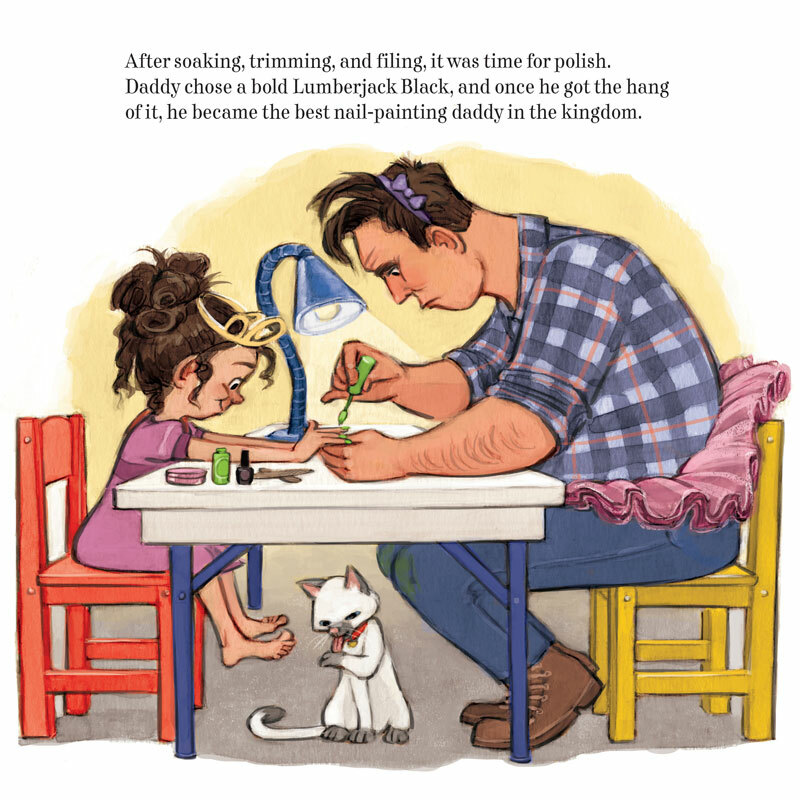 The joyous watercolor and digital illustrations show a happy flannel-shirted dad, with his princessy daughter enjoying activities together. This is a delightful book that will tickle children who love spending quality time with Dad. 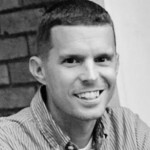 Josh Bledsoe is the author of Hammer and Nails, illustrated by Jessica Warrick, which encapsulates many of the things he loves about life: family time, a good cup of coffee, and impromptu living room dance parties. In addition to loving his job as an elementary school teacher, Josh enjoys trying to keep up with his Cross Country team on training runs, fishing with his best friends, and laughing on the couch with his beautiful wife. Josh considers himself a lucky man. Between his own two children and his “other” children (a flock of fun-loving fifth graders), inspiration for writing is everywhere. He is currently working on two middle grade novels, in addition to other picture book titles. Josh lives in Nashville, TN. Hammer and Nails is his first picture book. Jessica Warrick is the illustrator of Hammer and Nails, written by Josh Bledsoe. As a child, Jessica drew funny, somewhat inappropriate pictures for her friends at recess. Watching people laugh at her creations was her favorite activity, thus igniting an infatuation with illustration. In the past, she has worked as a muralist, cashier, grocery bagger, cookie decorator, dog and cat kennel attendant, landscape nursery worker, receptionist, data entry specialist, pizza delivery driver, overnight shelf stocker, and t-shirt printing intern. 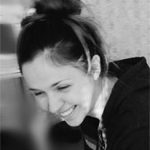 Today, she works as a full-time artist specializing in humorous children’s book illustration from her home studio. 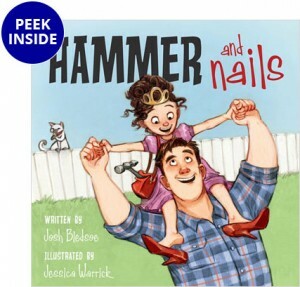 Hammer and Nails is Jessica’s third book. You can read more on Jessica’s blog or personal website. Error: Error validating access token: Session has expired on Sunday, 23-Sep-18 01:36:16 PDT. The current time is Friday, 26-Apr-19 01:06:35 PDT.